I’m excited to announce that the Vihm Cowl has been released in the September 2017 issue of Knotions, a free online knitting magazine. 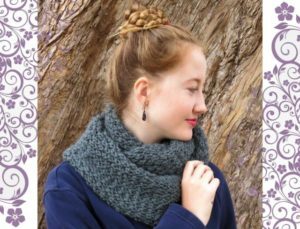 The Vihm Cowl is squishy, slip stitch pattern worked in three skeins of Knit Picks Mighty Stitch Bulky. It has a great teardrop texture on the front and a more striped but still interesting texture on the back. It’s a great pattern to keep you warm all fall and winter!